For as long as there have been designed offenses, the 3-2 formation has been around. Putting our point guard up top, our shooting guard and small forward on the wings, and the power forward and center down on the block, we maintain good spacing around the outside of the court while also maintaining a presence inside for post scoring and offensive rebounding opportunities. The 3-2 offense is best suited to a team with players who match their positions most traditional descriptions – a pass first point guard, wing players with good range and ball handling abilities, and bigs who are most comfortable with their back to the basket, down on the low block. For this, and all other offenses, it’s important to put your players in the best position to succeed. Your three outside players should be interchangeable, and should know the responsibilities of both the point guard, shooting guard and small forward for each play. That goes the same for both the center and power forward. 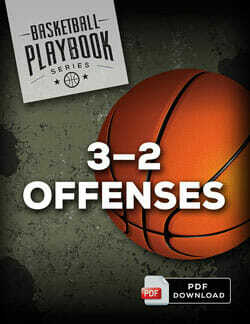 If you think this offense would work well for your team, make sure to check out the complete 3-2 Offenses Playbook. 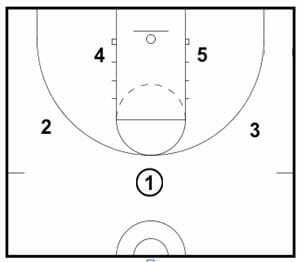 Or, if you’d prefer something that spreads the floor more and allows more space in the paint, check out these free tutorials on the 4 Out and 5 Out “Open Post” Offenses. Below is a sample play from the 3-2 Playbook. The point guard will hit the shooting guard on the right wing and then follow the ball, cutting through to the strong corner. 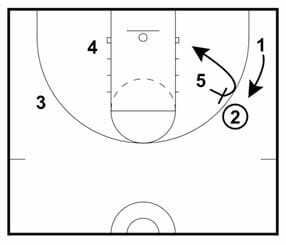 The center will next come up to set an inside ball screen for the two-guard, rolling to the baseline as the shooting guard penetrates into the paint. 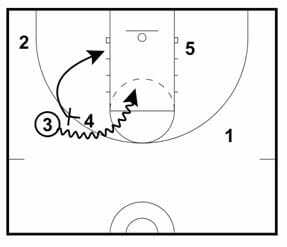 The point guard will lift, coming up to the wing out of the corner. 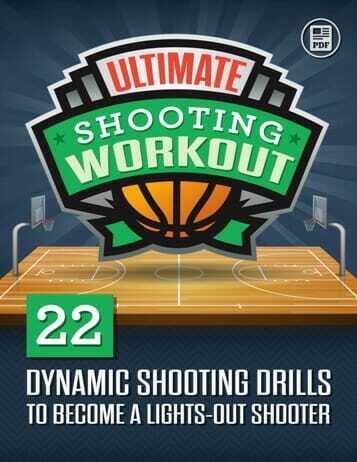 If the shooting guard doesn’t have his first or second looks, he can hit the small forward spotting up on the left wing and continue all the way through to the left corner. 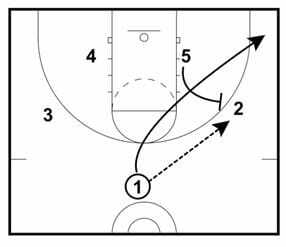 Again, our ball side big man is going to come up and set a pick on the inside, from which the small forward can penetrate and look to score, hit a big man with a dump off pass, or kick it out to a shooter on the wing. 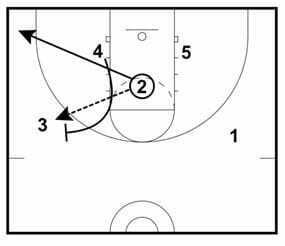 This is a continuous set, meaning if you don’t get any good shots on the first two picks, the play can be run through again – just have the small forward kick it out to the point guard and run a pick with the center, and continue running it through until you get a good shot. 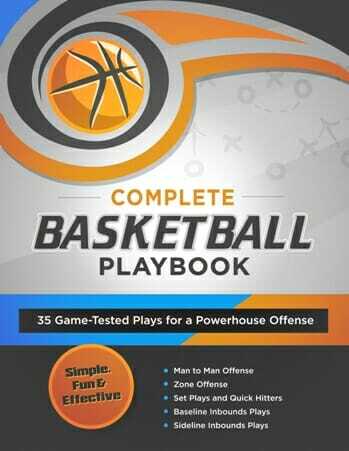 The complete 3-2 Offenses Playbook is packed with killer plays, guaranteed to boost your offense and win more games for your team! 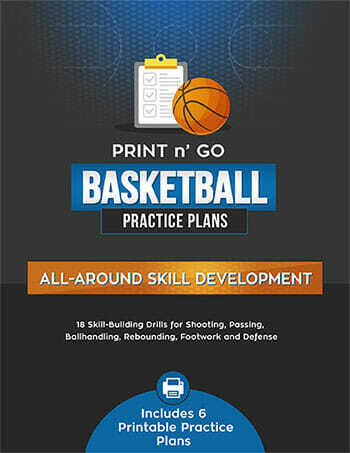 It’s everything you need to score more points in your half court offense and dominate your competition… from motion offenses, to continuity offenses, to simple quick hitters and set plays.